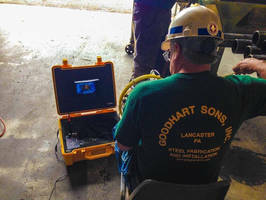 Goodhart Sons, Inc. a steel fabricator and installer based in Lancaster, PA., has acquired a Pandjiris Manipulator to assist in the manufacturing of tanks, pressure vessels and ductwork. 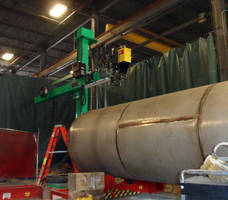 The Series "1200" Manipulator, was original a Series 1100 before being customized by Pandjiris specifically to meet the fabrication needs of Goodhart Sons, Inc.
Its basic size of 12' x 12', is mounted on a bolt-down base and has an 12' nominal arc height along with a 12' horizontal boom stroke at a variable speed of 3" to 116" per minute. This is electronically controlled with dynamic braking beginning 19-1/4" from the centerline of the column and 360 degree manual column rotation. The standard electricals are 230/460 volts, 3 phase, 60 cycle with 115 control. Wired to conform to National Electrical Code Standards. 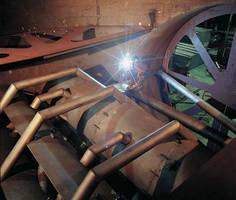 The manipulator boom is complemented by a Lincoln NA-5 Sub Arc welder and Air Powered Flux Recovery System to deposit more weld metal at fast travel speeds. This welder easily adapts to a wide range of wire feed speeds and sizes. 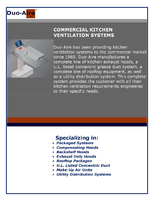 "We are an ASME National board-certified designer, fabricator and installer. 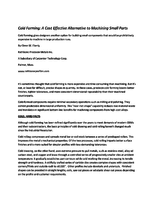 We need to meet or exceed ASME Standards to maintain a competitive edge in the industry. This manipulator will help us reach that goal by doing things faster and more consistently", says Goodhart Sons, Inc. Quality Assurance Manager Dave Kriner. He sees potentials in other areas of fabrication. 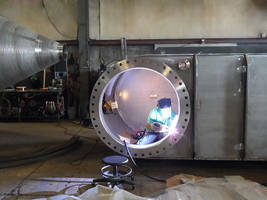 "We also make a lot of small and large diameter duct work, some it very large. I see this manipulator boom being a major asset to us in that area as well." 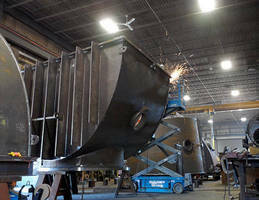 Goodhart Sons, Inc. is a fully equipped steel fabricator with over 175,000 square feet of production space. They are ASME as well as an AISC Member and are up to the challenge of completing your project with the highest level of quality, on time, and within budget. Miniature Piezoelectric Pump supports adjustable flow, pressure. Electric Column Lift Manipulator has 500 lb load capacity. Manipulators are designed for close tolerance positioning. 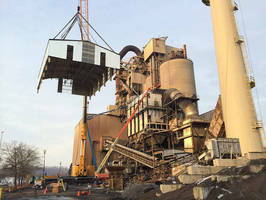 Lift Manipulator features fine height adjustment.